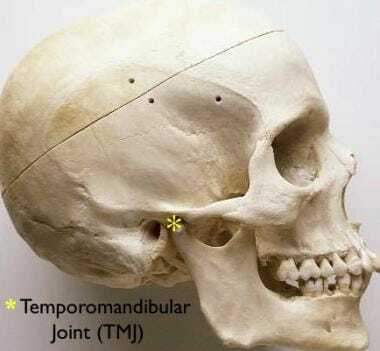 Dislocation of the temporomandibular joint (TMJ; see the image below) is a painful condition that occurs when the mandibular condyle becomes fixed in the anterosuperior aspect of the articular eminence. With dislocation, the mandibular condyles may be palpated anterior to the articular eminence. The diagnosis should be obvious through history and physical examination, and radiographs should not be necessary for confirmation. However, in the setting of trauma, radiographs should be obtained to exclude concomitant fracture. Patients who have experienced previous dislocation are more prone to recurrence. Additionally, patients with weakness of the joint capsule, anatomic aberration of the joint, or injury to the associated ligaments are at greater risk of dislocation. Chan TC, Harrigan RA, Ufberg J, Vilke GM. Mandibular reduction. J Emerg Med. 2008 May. 34(4):435-40. [Medline]. Nakashima M, Yano H, Akita S, Tokunaga K, Anraku K, Tanaka K, et al. Traumatic unilateral temporomandibular joint dislocation overlooked for more than two decades. J Craniofac Surg. 2007 Nov. 18(6):1466-70. [Medline]. Menon S, Sinha R. Gap arthroplasty for mandibular condyle dislocation and impaction into the middle cranial fossa. J Oral Maxillofac Surg. 2008 Nov. 66(11):2390-3. [Medline]. Guarda-Nardini L, Palumbo B, Manfredini D, Ferronato G. Surgical treatment of chronic temporomandibular joint dislocation: a case report. Oral Maxillofac Surg. 2008 May. 12(1):43-6. [Medline]. Baptist J, Baliga M. Dautrey's Procedure Revisited in Management of Recurrent Mandibular Dislocation. J Contemp Dent Pract. 2017 Jan 1. 18 (1):78-79. [Medline]. Jeyaraj P, Chakranarayan A. A Conservative Surgical Approach in the Management of Longstanding Chronic Protracted Temporomandibular Joint Dislocation: A Case Report and Review of Literature. J Maxillofac Oral Surg. 2016 Jul. 15 (Suppl 2):361-70. [Medline]. Xu J, Dong S, Zhou H, Somar M, Lv K, Li Z. The Supine Position Technique Method Is Better Than the Conventional Method for Manual Reduction of Acute Nontraumatic Temporomandibular Joint Dislocation. J Craniofac Surg. 2016 Jun. 27 (4):919-22. [Medline]. Weiss JP, Sawhney R. Update on mandibular condylar fracture management. Curr Opin Otolaryngol Head Neck Surg. 2016 Aug. 24 (4):273-8. [Medline]. Gorchynski J, Karabidian E, Sanchez M. The "syringe" technique: a hands-free approach for the reduction of acute nontraumatic temporomandibular dislocations in the emergency department. J Emerg Med. 2014 Dec. 47(6):676-81. [Medline].